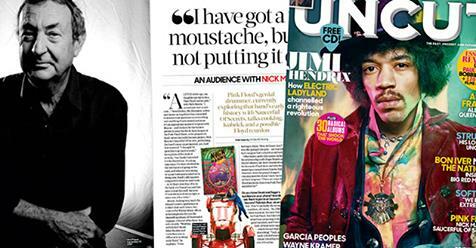 Back in June we brought you the news that the UK's Uncut Magazine were inviting your questions for Nick Mason. They posed a number of your submissions to Nick, in the latest of their 'An Audience With' interviews, in the new issue of Uncut, in UK stores now. In due course, the issue (cover date October 2018, issue 257) will be available in selected outlets in Europe and elsewhere. In a candid and wide-ranging chat, he discusses his soon-to-be re-released solo projects, producing The Damned, what's in the Pink Floyd archives, and the formation of his new 'early Floyd' band Saucerful Of Secrets. "What I didn't really want to do was go out as another version of Pink Floyd and play the best of Dark Side and so on. All this other material was there, lying dormant, and could be interpreted in a slightly different way… No, I didn't ask [Roger Waters and David Gilmour] to join in, because that would be Pink Floyd. But I did tell them what I was proposing to do, as good manners, and I have to say both of them were supportive – which I found slightly disturbing! 'Yeah, go ahead, make a fool of yourself…' I know David has looked at a lot of it online." Elsewhere in the magazine, from a Floyd perspective, there's a review of Nick's upcoming box set Unattended Luggage, and a mildly unimpressed review of Roger Waters in Hyde Park, which includes the comment that "Roger...gives an impression of an angry neighbour gearing up to throw a slipper at next door's cat"! The magazine can be purchased online now through MagazinesDirect.com, or Newsstand.co.uk.